The people of Rajasthan find reasons to celebrate throughout the year. 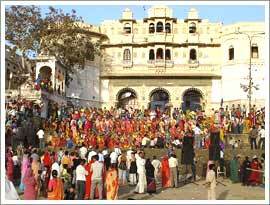 Mewar Festival is the celebration marking the advent of Spring season. It coincides with the famous Gangaur Festival of the state. The womenfolk sport colorful dresses and beautiful jewelry. They gather together and dress the idols of Isar (Lord Shiva) and Gangaur (Goddess Parvati) and offer prayers to them for a happy and long married life. This festival occupies a special place in the heart of the women of the state as it brings with it the hope of marital bliss. Even the unmarried girls participate in the puja (worship) of the idols of the divine. They pray for a spouse who is gifted with qualities of Lord Shiva. Mewar Festival holds both religious and cultural significance. The women take out ceremonial processions in the streets. After covering the various routes of the city the womenfolk finally come to the Gangaur Ghat at Lake Pichola. Now the wonderfully decorated idols of the divine are taken into a special boat and finally the idols are consigned into the water. Now the cultural side of the festival takes over. People sing and dance to the tune of traditional music. Brilliant performances by the local artists of the region portray Rajasthani culture in the most creative way. The festival ends with the exciting firework at night. This part is mostly enjoyed by the children.